Drive traffic to your products or seasonal landing pages using the Social share module. With the help of this module customers can share the pages of your webstore for points on Twitter and Facebook. Our solution automatically grabs all metadata from your product page, including the title, image and product description and displays customizable share buttons. By default, the page that the customer is currently on is shared, but this can be overridden. You can find the technical instructions here. Important!When working with the Social share module, please keep in mind that incentivizing shares is against Facebook and Twitter guidelines. There’s a possibility that Facebook or Twitter will ban your application. You can find the configuration page of Social share module by clicking on the ‘Modules’ link in the top menu bar, then selecting ‘Gamification modules’ from the list on the left-hand side. Set a global point value for all shares in the first section of the module configuration screen. 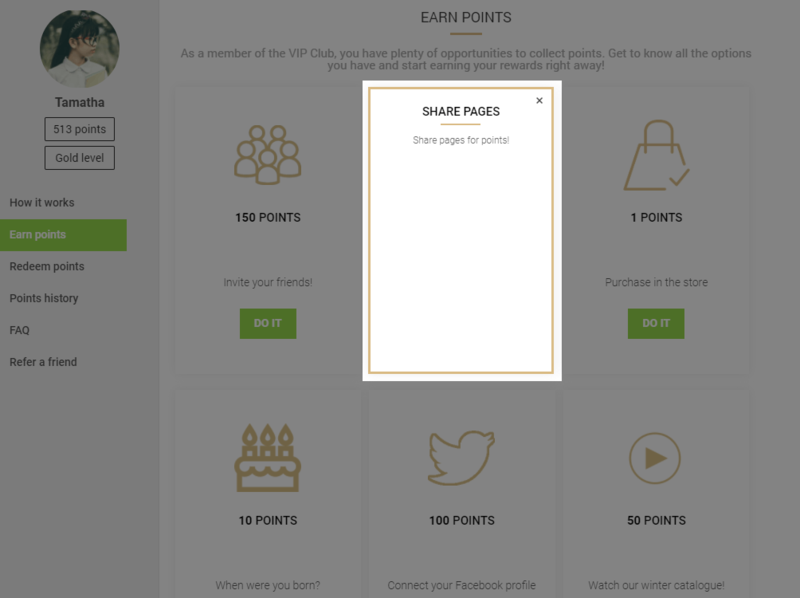 Points will be awarded after each share, regardless of the number of recipients. 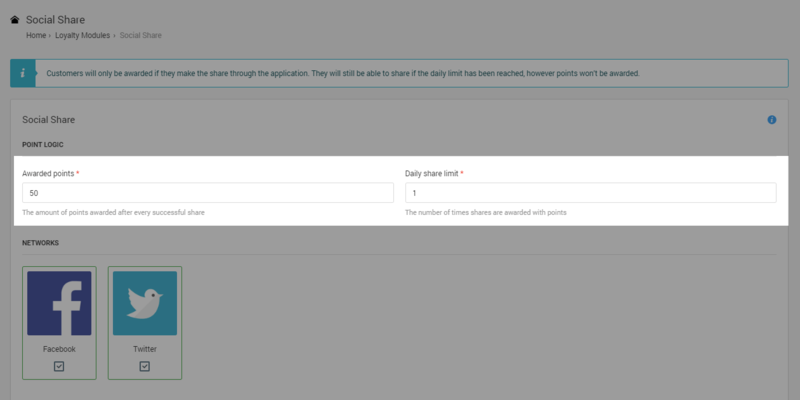 Set a limit on the number of times the customer can receive points for sharing on a daily basis, between 1 and 100 times. 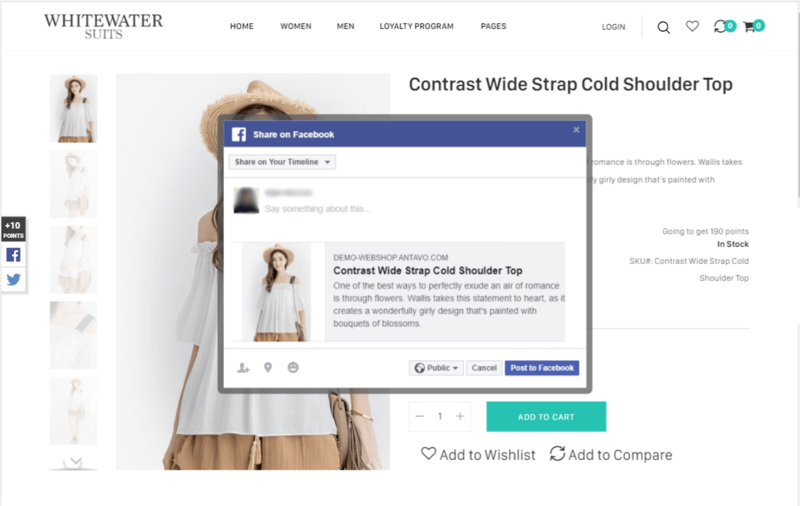 This will not affect the customer’s sharing capabilities: customers will still be able to share your pages as many times as they want, but they won’t receive additional points over the share limit until the following day. Sharing content with multiple recipients will count as one share when shared with all recipients simultaneously. We recommend that you reward no more than 3 shares per day to prevent customers from earning too many points in a day. Antavo supports sharing on two social networks: Facebook and Twitter. A checkmark will appear under the icon indicating that the selected network is active. Sharing buttons that open share pop-ups can be easily configured for both Desktop and Mobile. By default, every network you have selected will appear in the social share widget inserted into your webstore. Set the positioning of the widget on desktop or mobile by selecting the alignment that best suits your webstore and mobile site. Please note, that Antavo can only reward sharing if the popup that the customer uses is opened by Antavo. Instead of using Antavo’s share widget and buttons, you can implement your own share buttons to get Antavo open the share pop-up by adding attributes to the HTML elements. 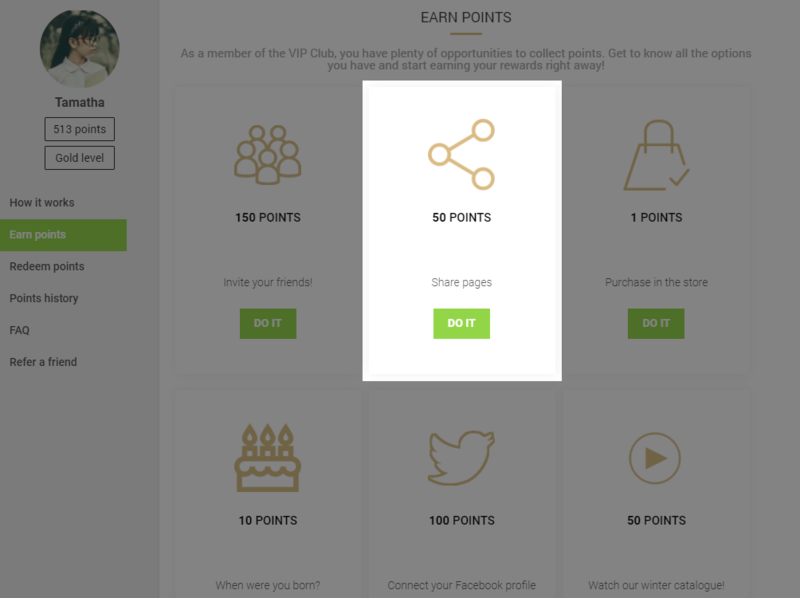 When the module is enabled, customers can learn how they can earn points for their shares in the Loyalty Hub. This notification appears as a card, alongside other cards that show customers the various ways they can earn points in the loyalty program. In case of Facebook, the page can only be shared with the help of the default Facebook share popup, which means that this pop-up is not customizable. However, there’s no such requirement for the Twitter share popup. Please, consult your Onboarding manager about the appearance of the Twitter popup.